Trust AAMCO Corvallis, OR to maintain your car, truck or SUV with our full service oil, lube & filter change. At AAMCO Corvallis, OR, we know scheduled maintenance is essential to ensure your car runs great for years to come. An oil, lube and filter change is at the top of any good techs must-do list. This is the single most important thing you should do for your car, truck or SUV on a regular basis. 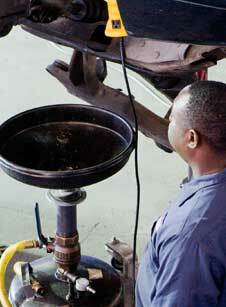 A lot of outside factors can affect the frequency rate in which your vehicle will require an oil change. For example, if you are often in stop-and-go traffic, city driving or go on frequent short trips, you should likely change your oil more often as this kind of driving can work your engine a little bit harder. To have a better understanding of what your specific vehicle requires, refer to your car's owners manual for the factory's recommendation on oil changes. AAMCO is your one-stop shop for all of your vehicle's repairs and maintenance. From the most basic to the most complicated issues, AAMCO's expert techs have you covered. An AAMCO Full Service Oil, Lube & Filter Change also includes our Initial Vehicle Check to ensure all major systems in your vehicle are in good working order. Plus AAMCO's 36-point Multi-Point Inspection®, to ensure all major systems in your vehicle are in good working order.